Lawyers for Broadway producer Scott Rudin (left) claim his production of To Kill a Mockingbird is the only one that can be performed near a major city. It doesn't matter that the new version, penned by Aaron Sorkin, is completely different from the Christopher Sergel play that's been performed by high school students and community theater actors for decades. Nor does it matter that the community theaters paid a licensing fee of at least $100 per performance to the Dramatic Publishing Company, which owns the rights to the earlier version of the play. 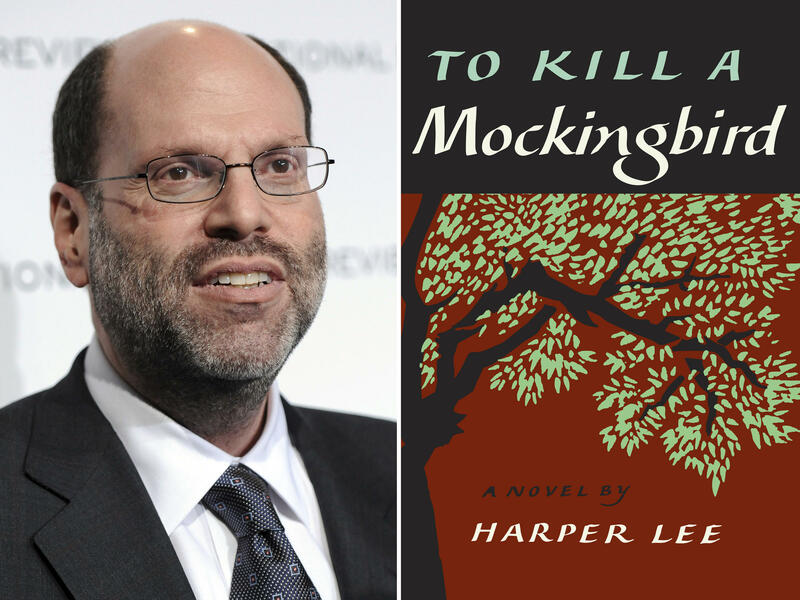 What matters, lawyers for Broadway producer Scott Rudin say, is that according to the contract between Dramatic and the Harper Lee estate, most amateur performances can't proceed now that a new version of the story is on Broadway. That 1969 contract, according to The Times, blocks Mockingbird performances within 25 miles of cities that had a population of 150,000 or more in 1960 while a "first-class dramatic play" based on the book is playing in New York or on tour. "We hate to ask anybody to cancel any production of a play anywhere, but the productions in question as licensed by DPC infringe on rights licensed to us by Harper Lee directly," Rudin said in a statement. "The Sergel play can contractually continue to be performed under set guidelines as described in detail in its own agreement with Harper Lee — and as long as those guidelines are adhered to, we have no issue with the play having a long life." The Lee estate sent several letters to Dramatic Publishing, arguing it had improperly granted rights to the community theaters, The Times reports. With the dispute unsettled, Rudin's lawyers in late February started sending letters directly to the theaters. The theaters are being threatened with damages of up to $150,000, the Associated Press reports. And so in towns across the country, performers are getting the bad news. The small production houses, unable to assume the legal risk, are either canceling their productions or looking for a more rural venue that won't run afoul of the contract. Even if they want to challenge Rudin's claim to exclusivity, the small theaters don't have legal wrangling in the budget. Board members of the Dayton Playhouse "have thoroughly explored avenues to overcome these obstacles and present our production, but under threat of substantial legal action from Rudinplay, the decision was made to cancel the production," they said, according to local media. Dozens of community and nonprofit theaters have canceled their productions, AP says. More than 25 are scheduled to perform the original version this year, The Times reports. It's unclear whether those productions will proceed. The Kavinoky Theatre in Buffalo, N.Y., which had sold around 3,000 advance tickets, will replace Mockingbird with an adaptation of George Orwell's 1984. "Thank you for supporting us during this difficult time," the theater posted on Facebook. "As we say in the theatre....THE SHOW MUST GO ON!!!!!!!!" And at least one local theater has decided not to abandon its production, but rather to move it. The Mugford Street Players, based in the Marblehead suburb of Boston, is moving its performances to Gloucester in order to circumvent the contract's restriction on performances within 25 miles of a major city. "I think Atticus Finch would be proud of these theater-lovers who are putting up a fight and making it happen wherever they can," Gloucester Stage Company Managing Director Christopher Griffith told the Gloucester Daily Times. It's not just community theaters in the U.S. that have been forced to shut down their productions. Last month a touring version of the Sergel play, set to run in the U.K. and Ireland, was canceled after being faced with legal threats. Rudin "made it clear" that his company "would commence legal proceedings against the tour's producer, originating theatre and all venues where it was due to be presented if the tour were not cancelled with immediate effect," the tour's producers said in a statement, according to Playbill. Rudin's production opened on Broadway in December to generally strong reviews. But the show was the subject of controversy last year when the Lee estate sued, claiming Sorkin's adaptation was too far removed from the original story. Rudin and the Lee estate settled the suit in May, just one month before the trial was set to begin.